As you climb up the well-worn stone steps to Pérouges, you quite suddenly leave behind the 21st century. 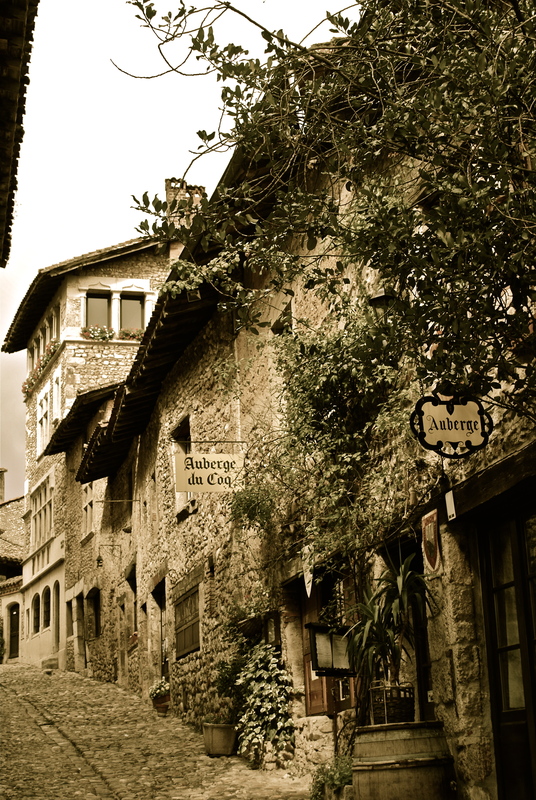 Step out onto cobblestones smoothed and rounded by centuries of inhabitants and find yourself lost in the middle ages. Inns, restaurants and small shops intertwine with centuries of history. Ivy grows on ancient walls, creaking signs hang from stone archways. This beautiful landmark town was likely founded by a Gallic colony returning from Perugia, Italy, before the 11th century – and it wasn’t until 1601 that this little gem was even French! Hungry? Try one of their famous galettes, a delicious little cake available in multiple establishments throughout the walled town. Today, it is literally (and officially), ‘One of the Most Beautiful Cities in France,’ so it’s hard to believe that 100 years ago, it was ever threatened with demolition! It is a truly magical place. It’s like fairyland, no? 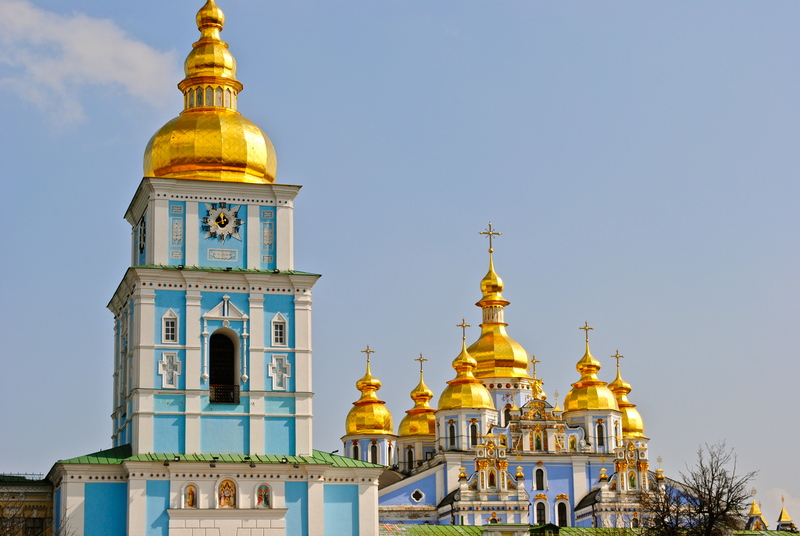 Overlooking the Dnieper River in central Kiev and facing down its beautiful sister, St Sophia, this magnificent piece of architecture is actually a functioning monastery. Though built in 1108-1113, it was demolished in 1934-1936 (three guesses who destroyed it…), and not rebuilt until 1999. So really, it’s only the site that’s old, not the cathedral itself. If you’ve never been to an orthodox cathedral, prepare for jaw-dropping beauty, both inside and out. Hershey-kissed shaped golden domes top its exterior towers, and inside, well, prepare for walls covered floor-to-ceiling in intricately-painted pictures and paintings. Golden walls and impressive idols line the alter. The whole interior is seems massively never-ending, and its acoustics are amazing; it’s like you’ve stepped into another world! Buildings like this make you appreciate the artistic capabilities of humanity all over again. 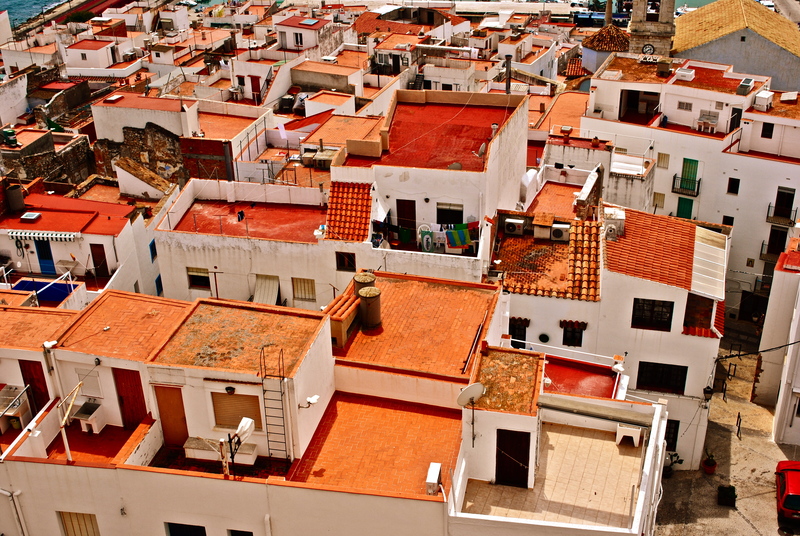 What comes to mind when you’re caught getting this birds-eye view of Spanish roofs? Lots of things: olives, fiestas, sangria, the tango, beaches, paella, terracotta, tapas, ancient architecture, the Spanish language, glasses of wine. Spain is a place that should be part of every person’s life. Take a leaf out of their cheerful, orange-y playbook and enjoy life. The Spanish comprehend the meaning of life better than most of us – perhaps not the reason we’re here, or anything that profound – but they do understand something very important that most of us routinely forget: we’ve only got one life on this earth, so why squander it doing things we don’t like? The Spanish may not understand the meaning of national debt or a strong economy, but they sure know how to eat, drink, sing, dance, travel, talk, cook and shop—at any given moment of our 24-hour day. Work comes second; life comes first. Maybe it’s not the richest country, but they sure are one of the happiest. Even though we’re not all cut out for life as a émigré Spanish person—we sure as hell are cut out for enjoying life like the Spanish. The historic centre of Warsaw, while having a lot of history, is not actually all that old. In fact, it only dates back 50-60 years. After the second world war, in which roughly 85% of Warsaw was destroyed and most of its inhabitants either fled, hid, died, or were arrested, the proud Polish citizens decided to rebuild their city from the rubble – using photographs, drawings, paintings, and even people’s memory, as most of the original blueprints were long lost. As the symbolic and historic (though not modern) centre of town, this square has been the sight of many important events, including patriotic manifestations before the January Uprising, usually entered around Sigismund’s Column in the middle. Due to its meticulous reconstruction, Plac Zamkowy, like the rest of the Stary Miasto (Old Town), is recognised by UNESCO. And this is Poland – so almost half the year, it’s covered in snow. And, it’s also my favourite place in Warsaw! Norway is a cold place. The average daily temperature in Bergen, for example, ranges from 2-17 degrees Celsius, depending on the season (sometimes in the twenties in the summer) . Far up north can get to -40 in the coldest parts of winter. Even in late spring, summer, and early fall, a scarf, overcoat and pair of mittens is a good idea. That said, when you look at the map, Norway should actually be a lot colder than it is, but due to the Gulf Stream, Norway has a much nicer climate you’d expect. It shares a latitude with Alaska, Greenland and Siberia- places that make shiver even in mid-summer when you hear their names- but luckily for the Norwegians, they got the better deal climate-wise. Regardless, I was still cold when I visited in late April, and wearing far more clothes than I had been wearing even in Poland. The Norwegians seem to have perfected the cold-but-stylish look – at least, everyone struck me as properly dressed for the weather while still chic (as opposed to the Spanish who insist on wearing heavy winter clothes when it’s 17 degrees out). Not sure I’m in a hurry to rush off to live in Norway…but it was still a pleasant surprise that I didn’t need to wear a parka. 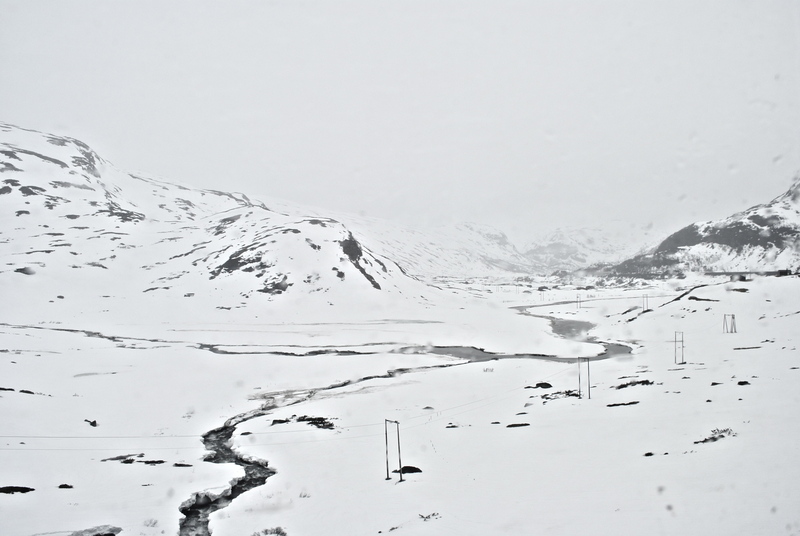 Not that this photo, taken from a train window just past Myrdal on my way back from the fjords, really helps the frozen-climate stereotype though! Infinity is a curious thing; good or bad or some combination of both, depending on how you interpret it. I never really understood infinity. How could one thing stand still and unwavering enough to ever be rendered infinite? Nothing, in effect, is infinite. Everything changes—as it should. Change is not a thing to be feared. Yet, people have always been afraid of change, and for millennium, people have tried – and failed – to arrest this change, something we could all take a lesson from. 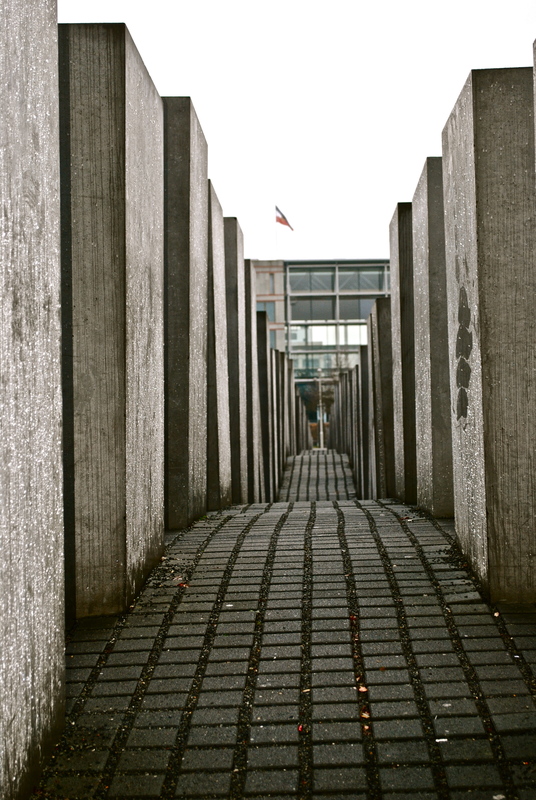 Standing here in the Holocaust Memorial in the heart of Berlin, lost amongst rows and rows of daunting grey stone slabs of varying heights, the feeling is overwhelming. Here is the drastic evidence of one of the most awful resistances to change. You don’t need a history lesson; millions died because one man wanted to erase certain groups of people, and in the end, he was stopped, and life went on, at the same time, finite and infinite. And life will continue to go on and on, introducing new challenges and new ideas and new characters. I just hope that the cycle that many consider infinite isn’t so. I just hope that so-called infinity is malleable and changeable, because as these mournful, scary grey slabs remind us, life is never infinite. Hiking is generally a pleasant, self-inspiring, soul-searching kind of gruelling challenge. Summit-ting a mountain is even more rewarding, especially when this kind of view and this kind of lunch awaits you at the top. On a solo trip through France, I was determined to spend a day hiking, though being a woman travelling alone who didn’t happen to speak much French, doing anything too crazy seemed a bad idea. This is the summit of Col-Vert (1766m) in the Pre-Alps. I hiked a trail leaving from the small village, Villard-de-Lans recommended to me by the helpful guides at the mountaineering office in Grenoble because it is a safe, well-traversed area that also affords amazing views. It turned out to be one of the most amazing days full of great people, great views, great food, and great challenges. 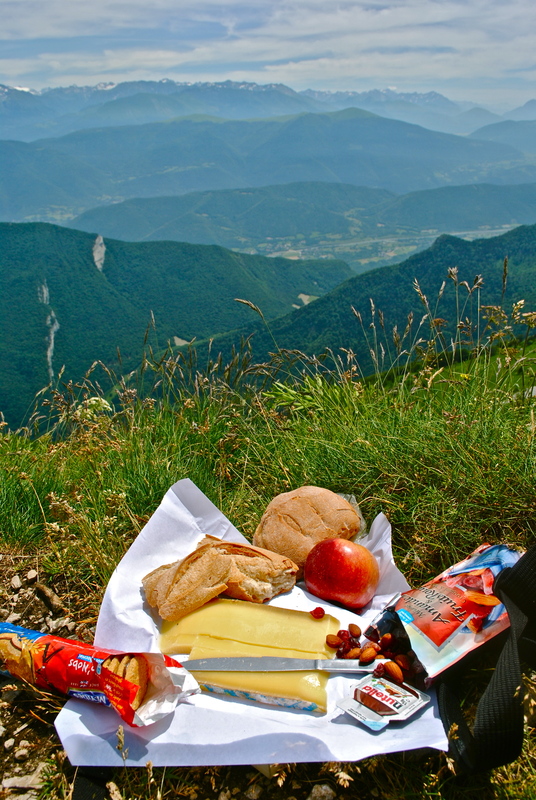 On the way, I bought local bread and cheese at the outdoor market, and the rest of my picnic I picked up at the grocery store for one delicious picnic with an unforgettable view! As a side note, to the left just outside the frame is the infamous Mount Blanc. Most visitors come to this resort town in the summer to take advantage of its beaches. Despite having a healthy 183,000 residents, Bournemouth is not a Cathedral Town (meaning, as you may have guessed, it has no cathedral), which is, in the complicated government/political/religious system in Britain, apparently important. It does, however, have St Peter’s Church. Most English churches and cathedrals, while well-built, are not terribly unique. However, St Peter’s Church is a slightly different story. There are one or two oddities in this town to call your attention away from its sandy shores such as the Bournemouth Eye (a hot air balloon rising 500 feet!) or the plaque marking the former location of Aubrey Beardsley’s house (the artist who added the famous illustrations to Oscar Wilde’s plays), or even the eccentric church that’s since been converted into a nightclub. 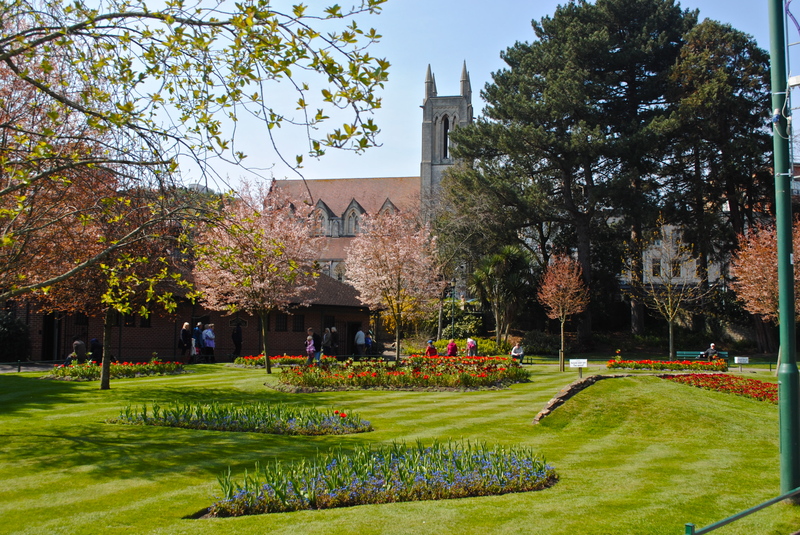 But inside St Peter’s, you’ll find the heart of Bournemouth – literally. Tombs marking the graves of Mary Shelley (author of Frankenstein), her mother Mary Wollenstonecraft (author of A Vindication of the Rights of Woman), William Godwin (Shelley’s father), and Percy Bysshe Shelley, Shelley’s husband and a famous English Romantic poet. Bizarrely enough, the cremated remains of Percy’s heart were put in St Peter’s after his death. Sadly, I never got to see their graves…ah well. Next time. Sweet ride? Europe is sort of big on bikes. The Tour de France is probably the first thing that comes to mind after hearing the words “bike” and “Europe.” Of course, there are plenty of other bike races here, but to most Europeans, the bike is first and foremost a means of transportation. It’s quick (quicker than walking anyway, and sometimes quicker than driving if there’s traffic), it’s cheap, it’s good for the environment and it’s a good way to get in shape. Baskets attached to the front allow the user to carry groceries, purses and other larger items, and seats attached to the back allow the bike to become the family car. “Old fashioned” or “vintage” bikes (as Americans call them) are actually quite common here, and sure make for some stereotypical photos. 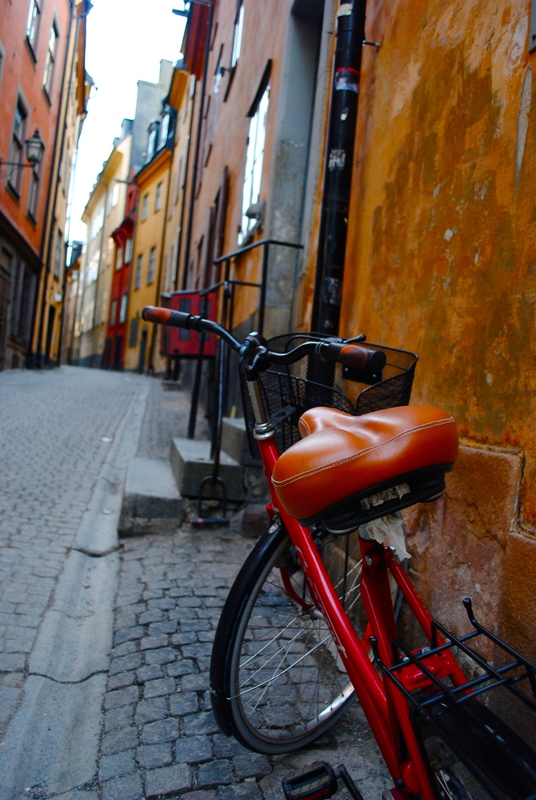 This bike was in Stockholm, Sweden–an ironic place to find a bike as the city is an archipelago made up of 14 islands (with more than 30,000 in the Stockholm archipelago!). And yet, the bike remains a popular method of transport. Me, I prefer the trams and the buses (dryer and warmer!) but I have to admit, it’s a great way to get around while staying slim enough to merit eating copious amounts of chocolate! The Baltic Sea is a basin of water in the north of Europe. Bordering Denmark, Estonia, Finland, Germany, Latvia, Lithuania, Poland, Russia and Sweden, it also happens to be one of the finest places to find that curious orange-red, stereotypically Baltic mineral, amber. As the Baltic is almost always too cold to properly enjoy its beaches, one of the nicest ways to see the sea is by way of bike. Historically, the sea has played a major role in commerce, trade and movement of peoples, including containing the main trading routes of the Hanseatic League. It played a major role in other trades too, such as the lumber, flax, hemp and fur industries. Sweden’s silver and iron mining industry and Poland’s salt mines have also profited from the Baltic Sea trade. 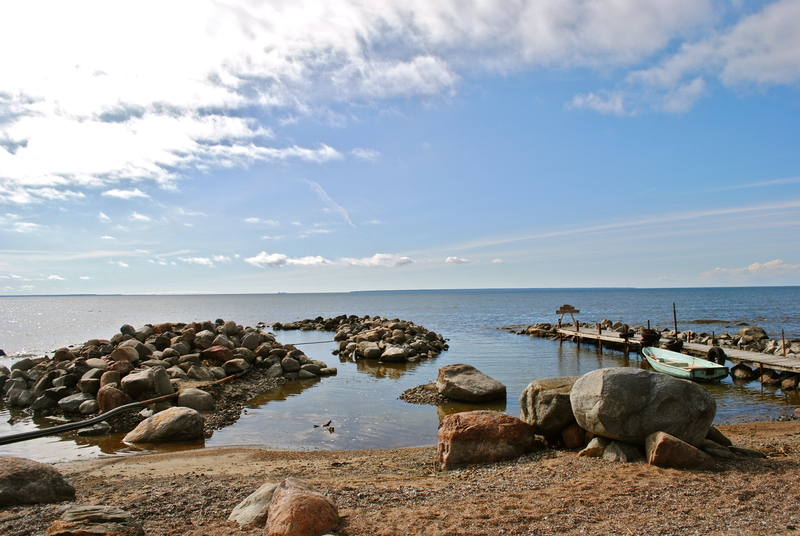 All in all, if you find yourself in Northern Europe, the Baltic is worth seeing–and hard to miss! 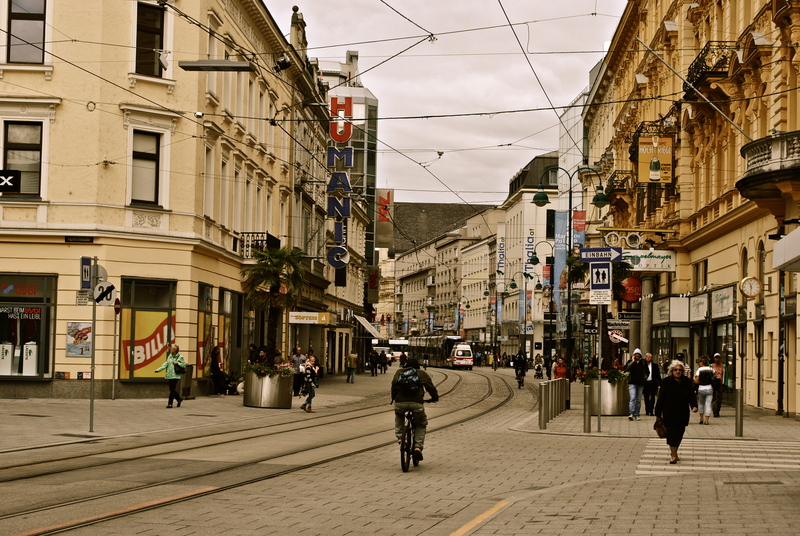 Landstrasse is the main thoroughfare in little-known Linz, Austria. 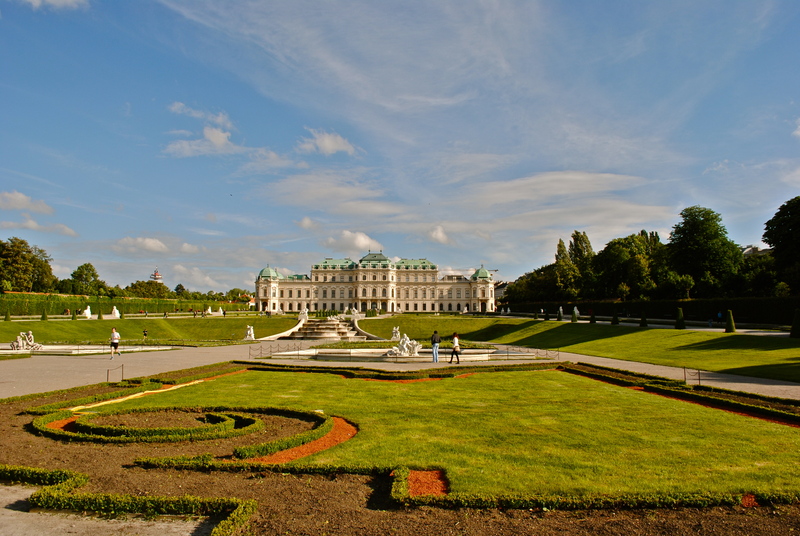 As it is equidistant between Salzburg and Vienna, it is literally wedged between two giants, and it is always overlooked. No, it doesn’t have Mozart, nor does it have the splendour of the Ringsrtausse, but it does have a bit of that Austrian charm. It feels a bit like a step back in time, Linz. Wires criss-cross the sky, and tram tracks run down the centre of the narrow street. 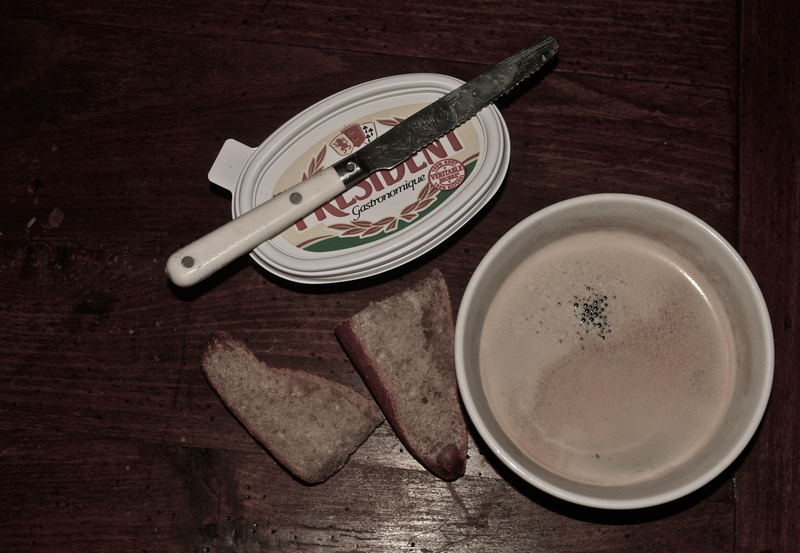 Bakeries and small shops line its edges. People hurry down the street with the day’s shopping under their arms. 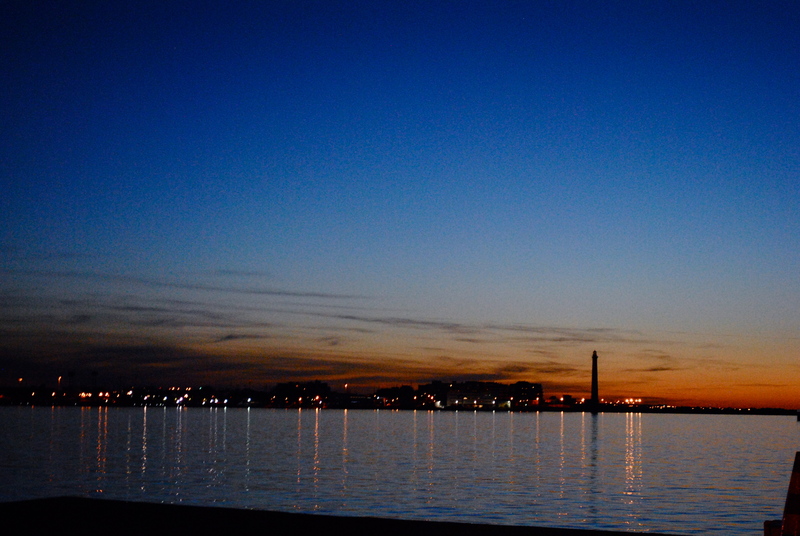 This is a place that people live, this is a place full of energy and life, not just pretty buildings–making it that much easier to become part of the city, instead of just looking at it from a distance. There’s something about staying with local friends in Linz that makes you think you found the heart of the Austrian people–instead of the heart of the Austrian tourists. Wrocław, formerly known as Breslau (when it was German) is a Polish city with a confused history and changing borders. Now it is predominately Polish, though when the borders shifted and it stopped being German at the same time that L’viv stopped being Polish, all the Germans were sent back to Germany and all the Poles now living in L’viv, Ukraine were sent across Poland to live in the newly Polish city of Wrocław, hence the many Ukrainian restaurants and other Eastern influences that now co-exist here with a few Germanic influences on top of the Polish ones. This is Wrocław as seen along the Odra River, with the Cathedral rising up behind. 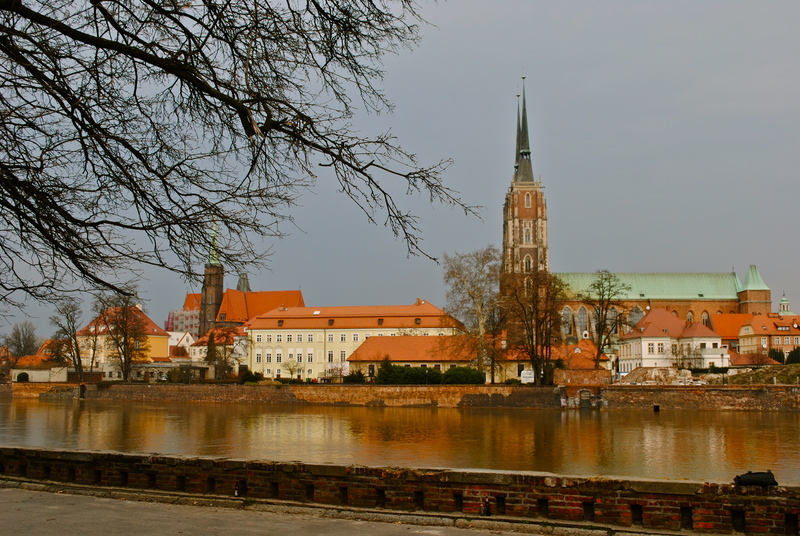 The city was established in the 10th century, and the cathedral complex on Ostrow Tumski (“Cathedral Island” even though it’s not an island) is the oldest section. It’s quite a picaresque city – and in 2016, it has been chosen as one of the European Capitals of Culture, a lovely honour that means Wrocław better get to work on getting it ready! 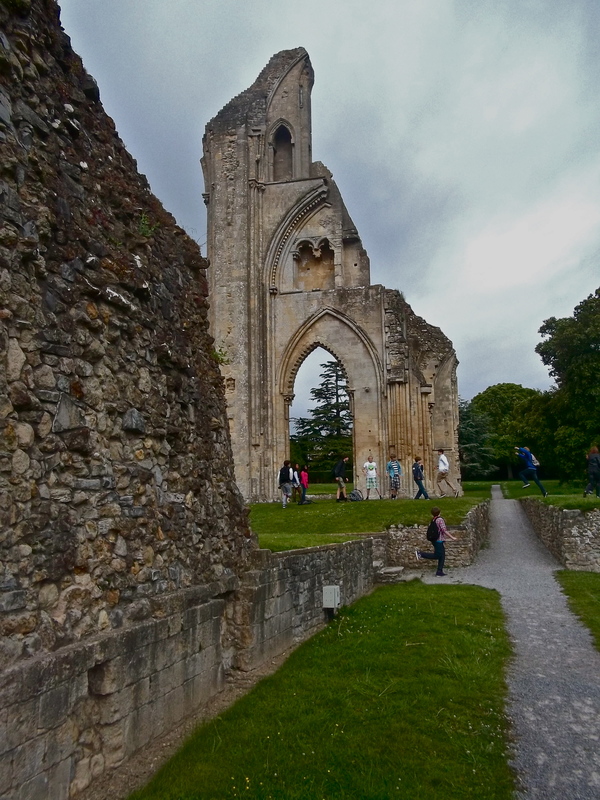 Welcome to the ruins of Glastonbury’s abbey, established 712 AD (and disestablished 1539), of Benedictine origin. As a visual monument, not much remains. However, it’s not what’s above-ground so much as what is – or isn’t – buried below its grassy flooring that makes it interesting. To start with, legend has it that Joesph of Arimathea founded it in the 1st century. Secondly – and more fantastically – legend claims that this is the legendary Avalon of your childhood stories, that this is the final resting place of everybody’s favourite storybook hero, King Arthur. Supposedly, Arthur and Guinevere were buried here long ago and later discovered by the abbey’s residents (conveniently, right about the time they were low on funds), attracting visitors from afar to view these famous graves – all the while supplying the monastery a steady income. Then, sometime in the 1500s, a fire ravaged the complex and the graves were lost or destroyed – rather conveniently, I might add. Real or not, the cunning monks had the last laugh – because people still come from afar to see Arthur and Guinevere’s graves – and ironically, even though the coffins are long gone and only a small sign remains, these visits are still providing the monastery with its steady income. Dubrovnik is an up and coming tourist destination. Sporting beautiful streets, delicious foods, amazing views, orange-tiled roofs, ancient ruins and the lovely Mediterranean, it’s like Italy–without the Italians. And with locals who natively-speak a slavic language but who also speak rather amazing English. And with better prices. And maybe slightly less tourists. In 1979, it was declared a UNESCO site, and in 1991, it broke away from Yugoslavia. Because of the political turmoil, people just didn’t go to Dubrovnik for a long time. But, then something changed. Politics settled down, and this “new” country began to grow. Somebody “discovered” it and told their friends who then in turn told their friends. Now hoards of people visit Dubrovnik. But don’t let that deter you! Dubrovnik is a Mediterranean masterpiece! Nope, not Greece, not Italy, not even Cyprus. It’s actually France! Yes, it’s a little surprising to find such stereotypically Roman architecture so far from home, but there’s actually a decent amount of Roman remnants here in France. 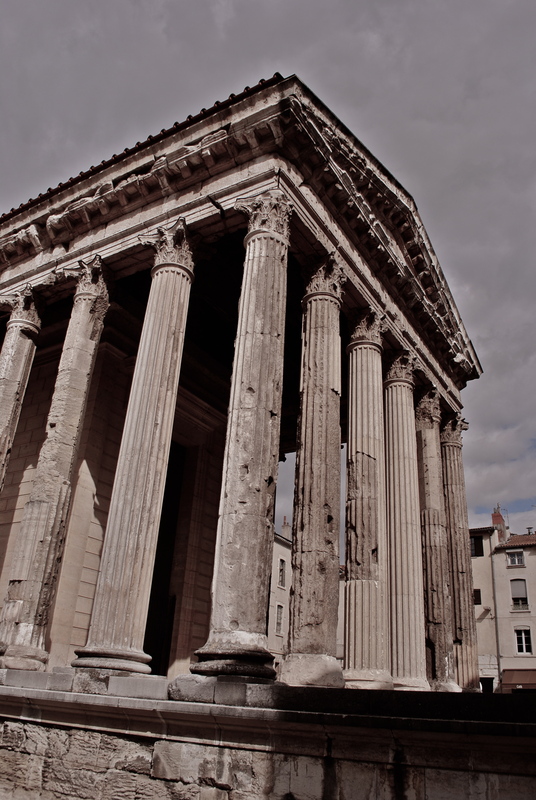 The temple was erected by emperor Claudius and survived the fall of the Romans as well as everything since then mostly because the citizens had the foresight to convert it to a church (“Notre Dame de Vie”). It dates back to 10-20 BC – needless to say, it’s very old. And very unexpected. While Vienne is an attractive town, it’s not terribly distinctive at first. One walks through small streets ducking old women with shopping carts and old men with berets and baguettes (I might be playing up the stereotypes a little). One turns the corner, and suddenly, wham. An open square lined with cafes and little shops, all facing this magnificent Roman temple dedicated to a long-dead-but-never-forgotten emperor. C’est magnifique, ne c’est pas?